Como Lo Hago En Ortopedia Y Traumatologia Pediatrica? 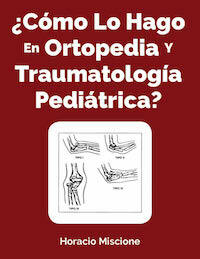 Originally published by Hospital de Pediatria Garrahan in Buenos Aires, Argentina and Fundacion Hospital de Pediatria Garrahan in 2007, Horacio Miscione's "¿Como Lo Hago En Ortopedia Y Traumatologia Pediatrica?" focuses on the non-invasive diagnostic and therapeutic approach for the treatment of young patients and surgical reconstruction of adolescents. "The emphasis of the treatment of several pathologies with high incidence rates," the editor writes, "is not placed any longer on treating the underlying etiology; thus stressing the need of devising an effective plan for the diagnosis and treatment." The syllabus is a follow-up of different pathologies described by several authors, compiling 81 protocols of different orthopaedic pathologies in childhood.